The HERA buttstock, fore grip, compliment this AR-15’s EOTech sight, and Magpul D-60 magazine very nicely. When I first saw the HERA Arms CQR furniture set at our friends at TheFirearmBlog, I probably had the same reaction as many of you had – “what kind of science-fiction outfit is this?” However, the more I looked, the more I liked. In fact, I quickly began to see several key benefits of the CQR furniture over traditional buttstocks and fore grips. Made with high quality and very durable polymer, both the buttstock and fore grip include metal inserts for QD sling attachments. The the HERA CQR AR-15 accessories give the shooter a slightly modified grip than traditional pistol grips and fore grips. The HERA CQR pistol grip is angled slightly more to the rear, while the CQR fore grip mirrors the rearward angle of the pistol grip. Offered exclusively through LAN World. The enclosed designs of both the CQR buttstock and fore grip provide the shooter a strong structure that should help prevent snagging, particularly on heavy vests worn by SWAT or up-armored patrol officers. Both accessories offer the user the option of ambidextrous QD sling mounts or a more traditional sling loop method of carry. Additional Picatinny rail space on the buttstock allows monopod or other accessory attachment. 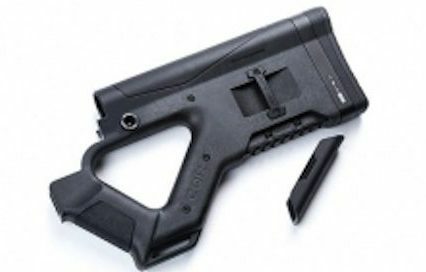 The CQR buttstock is a fixed stock design, with a small amount of adjustment to the length of pull (LOP) through the use of various sized recoil pad attachments. The bottom of the CQR buttstock has a removable cover exposing a small Picatinny rail section for mounting other desired accessories. 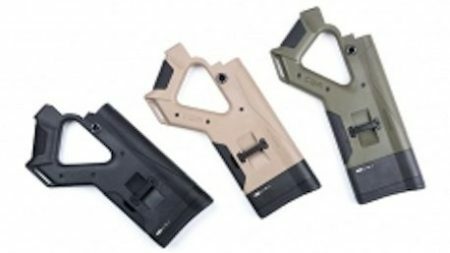 The HERA Arms CQR buttstock comes in black, tan, or green. The fore grip (HERA calls this the front grip) is designed to mount to common Picatinny rails. The rear side of the CQR fore grip is angled forward, and specifically designed to accept the Magpul D60 60-round drum magazine. The CQR fore grip takes on a similar look of the Magpul AFG (angled fore grip), with the forward hand stop curving downward at the front of the QCR. This would allow users to rest their support hand on the front or outside of the CQR grip to provide counter-pressure to recoil using the downward front stop like the Magpul AFG. HERA CQR components come in black, tan, and green as well. However, the CQR fore grip gives the user an optional grip methods as well. The front of the CQR angled grip straightens at the very top. This provides users with a grip point for the palm while allowing the support thumb to rest above the grip on the handguard. This method provides the user good support for accurate shooting, while also allowing quick control for mounted lights or lasers. This method can possibly provide the shooter the ability to rest their thumb on the top of the hand guard (a popular method), while using their ring and pinky fingers to curl around the straighter section at the top of the angled grip behind the forward stop. Finally, the user can bring their hand back to fully grip the angled fore grip. By completely grasping the fore grip with the palm, fingers, and thumb many shooters find their greatest control with their support hand. The HERA Arms QCR’s unique angle on the more traditional vertical fore grips mirrors the grip the shooter has on the CQR pistol grip. This can provide a very intuitive feel for gripping the selected AR-15. HERA Arms has a compliant CQR buttstock option as well. Thinking about the larger civilian market, HERA Arms has produced compliant buttstock models for States with more stringent rules on America’s most popular rifle (AR-15). By simply adding a solid piece to the previously open buttstock design, the CQR becomes an enclosed buttstock like more traditional rifle designs. A HERA Arms CQR compliant buttstock is still attractive, and provides a modified pistol grip for the user. This added feature meets the requirements of the draconian laws restricting more common options on the AR-15, allowing users in those States to enjoy the CQR furniture as well. The benefit of the HERA design is shooters still maintain a near-normal pistol grip on their AR-15, that allows for easier access to control levers. 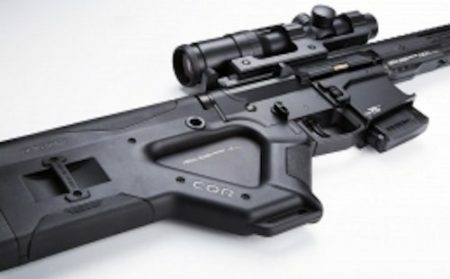 Initially when I saw the HERA Arms CQR accessories I shook my head thinking this was some king of sci-fi movie prop. However, the more I looked into these options the more I saw potential. I’m hoping to be able to put my hands on these items at SHOT Show next month. Until then what do you think? is this compatible with any of mesa tactical shotgun butstock ar extensions… Seems like it would possibly fit onto the high tube 870/590 buttstock knuckle..
Archael the compatibility is not specifically mentioned by Hera, but it does appear the telescoping adapters would accept the Hera stock. I have a request in with Hera Arms for a definite answer. “Great question. As long as the receiver and the tactical tube are identical to a standard Mil Spec AR015, with mil spec carbine tube it should work. Otherwise it would just go on the tube and hang in space as it would not mate up with the receiver correctly. Is the CQR foregrip classified as a vertical grip by the ATF? Shawn I would say these are indeed within the BATFE definition of a vertical grip.